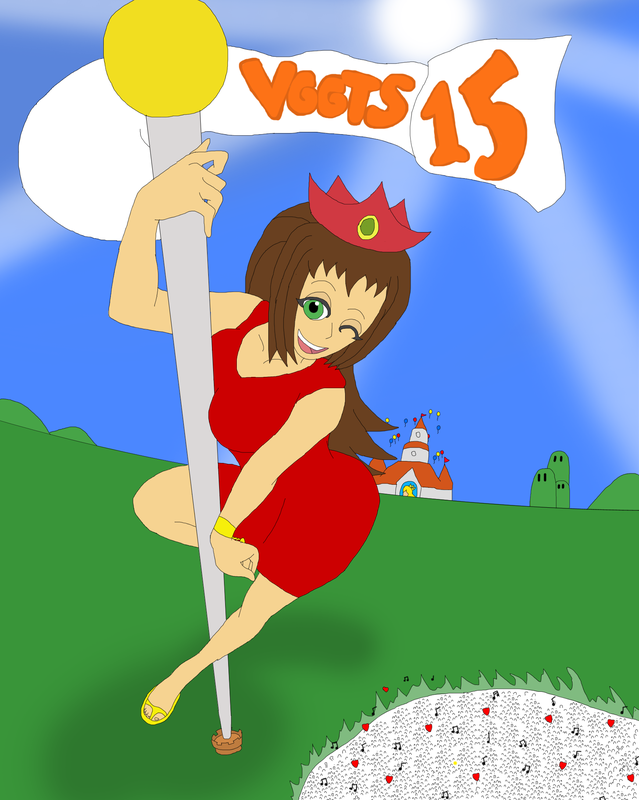 Princess Apple was created as far back as 1999, three years before I made this website. 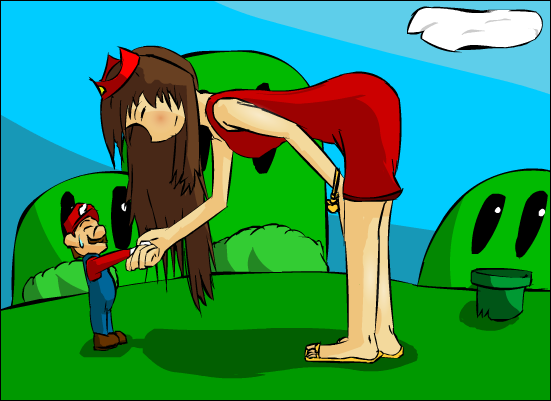 I had discovered a Super Mario fansite, and one part of the site was sending in profiles for your own customizable character that you could add to any facet of the Mario universe (video games, cartoons, comics, etc.). 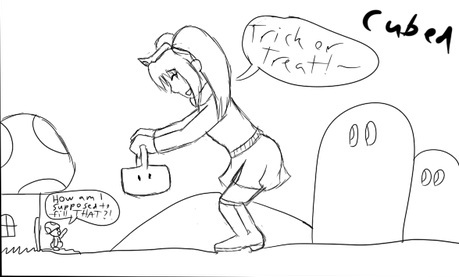 Naturally, I wanted to submit at least one original character, and it didn't take me long to think of one. Probably my all-time favorite episode of the Super Mario Bros. 3 cartoon was 'Sneaky Lying Cheating Giant Ninja Koopas.' One character I remembered was Prince Hugo the Huge, and I used to remember thinking... what would it be like if there was a princess by his side? And so, I first thought of Princess Apple. 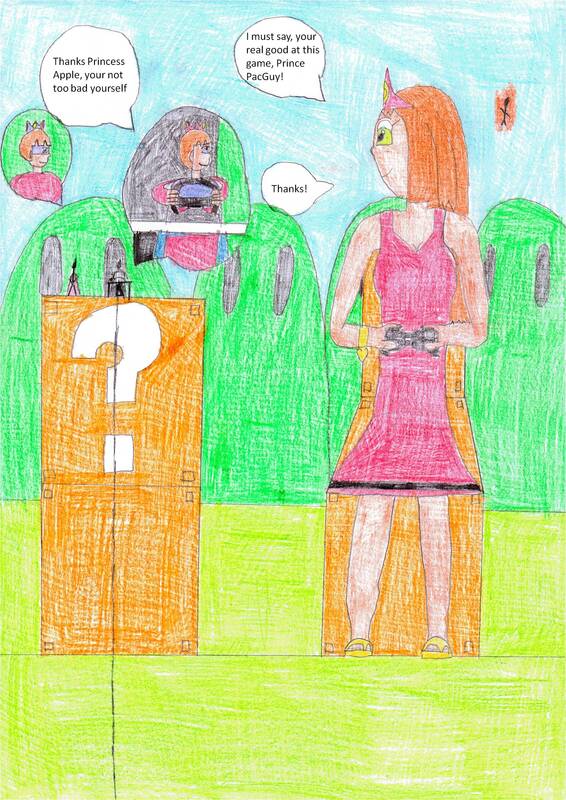 The name Apple came from playing Mario Golf on Nintendo 64, when every female character (Peach, Plum, and Maple) was named after a fruit (or close to it), and so I thought Apple would be the next logical step for a new princess name. 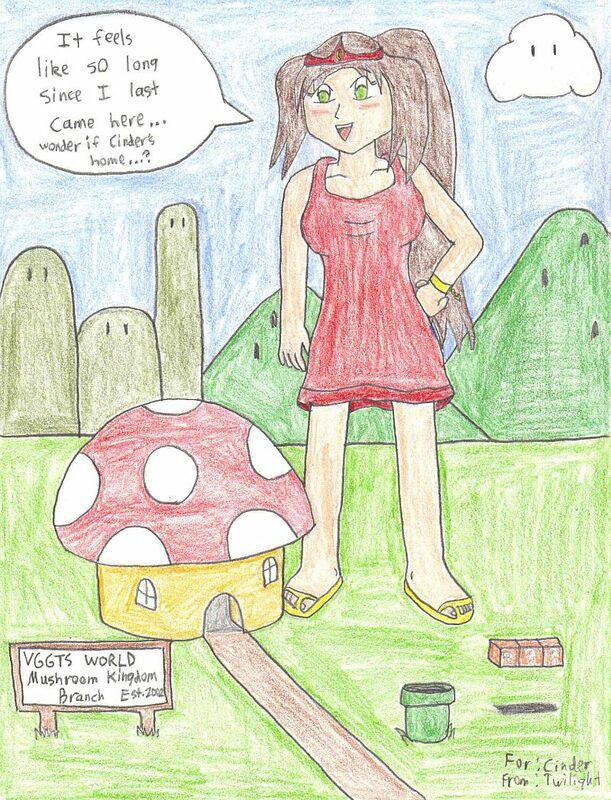 In 2003, I started writing an experimental Super Mario Bros. VGGTS story. 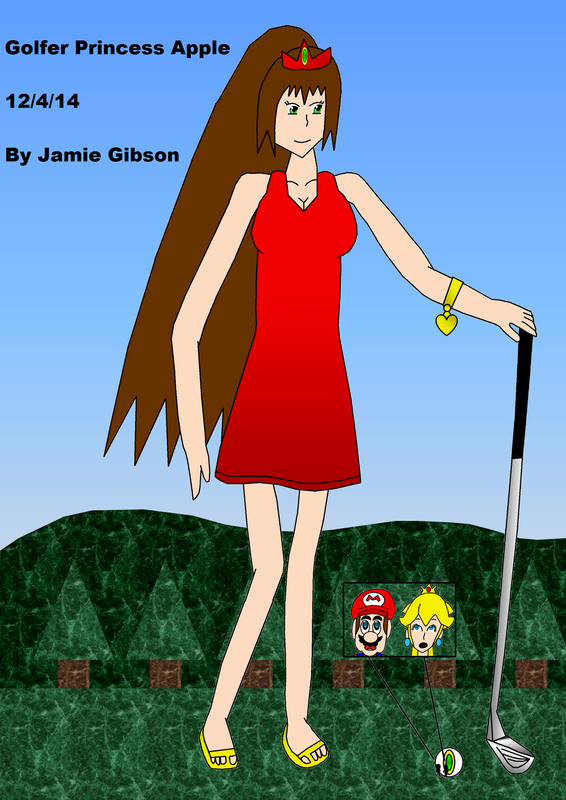 This story, titled Mushroom Goddess, was to take place entirely from Peach's point of view as she walks around the Mushroom Kingdom before stumbling into a warp pipe that makes her gigantic. Considering the experimental nature of the story, it suddenly came to me... why not bring Apple back? 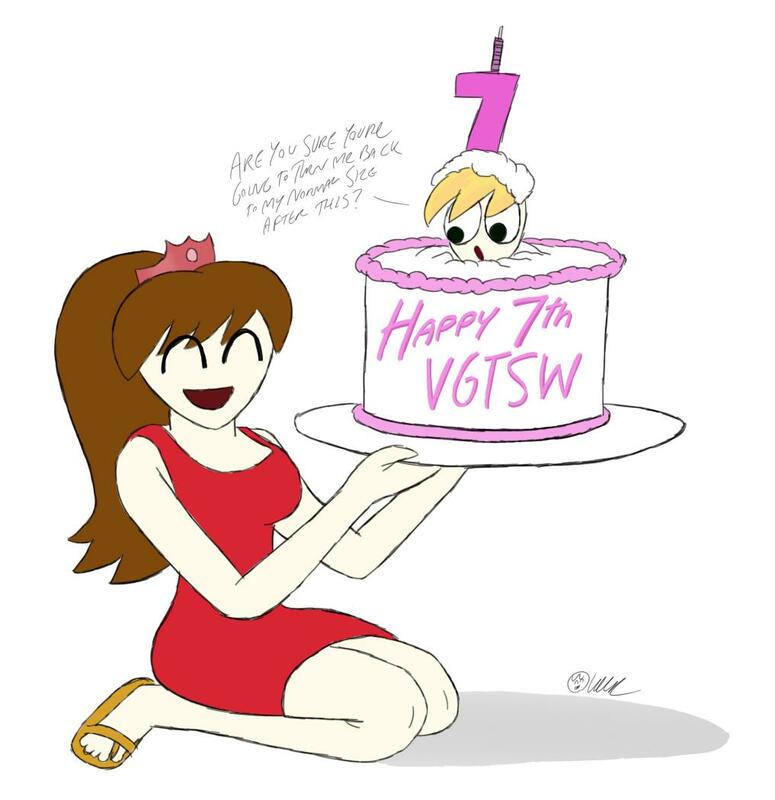 And so I introduced the VGGTS community (or re-introduced to those few internet dwellers who remembered the original bio) to Princess Apple. Not much came out of it though, and understandably so. Despite my best efforts to describe Apple's appearance, nobody could get a good lock on what she looked like. It also didn't help that the story was pretty much a flop. I cancelled it after just one chapter when I figured the story wasn't going to go anywhere. Apple did get a brief second appearance in my Christmas-themed story, A Peachy Christmas, written that same year (in only four hours, in fact, during Christmas Eve), but that was pretty much it. 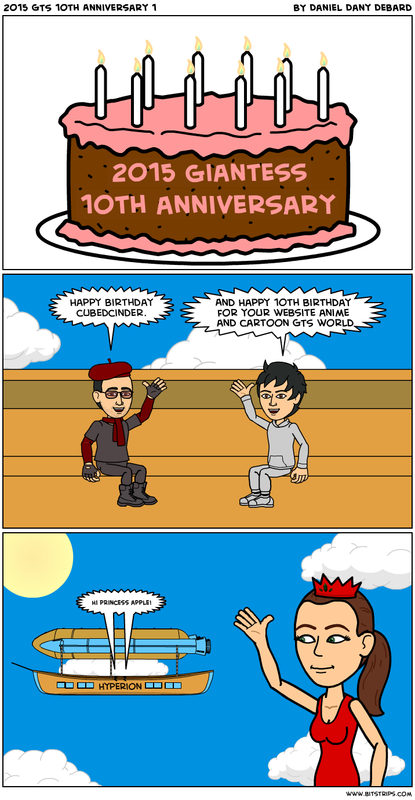 I decided to keep Apple by the wayside as I got back to focusing on the website rather than my own character. Three years passed with a couple on-and-off attempts to bring the character back during that time, only to hit a reality check every time that it seemed nobody cared about the character. 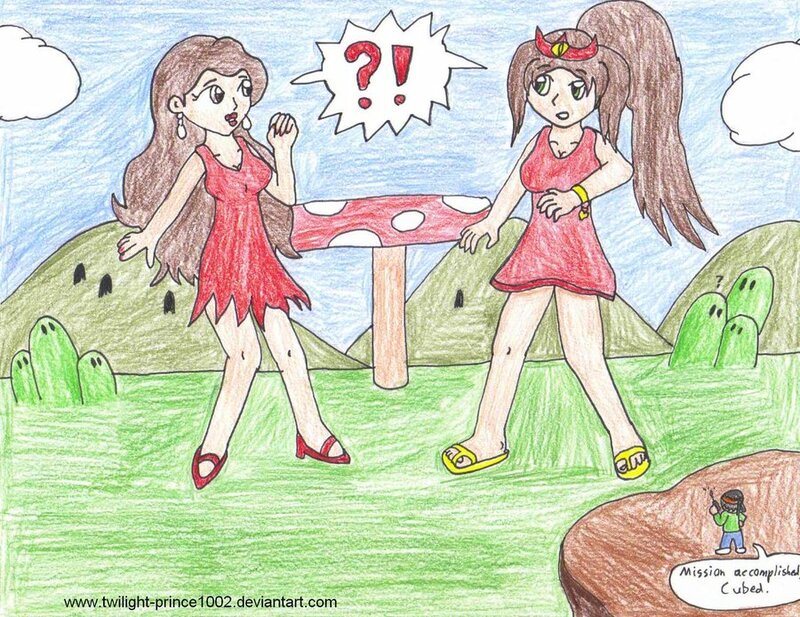 In September 2006, however, one writer actually remembered Princess Apple. 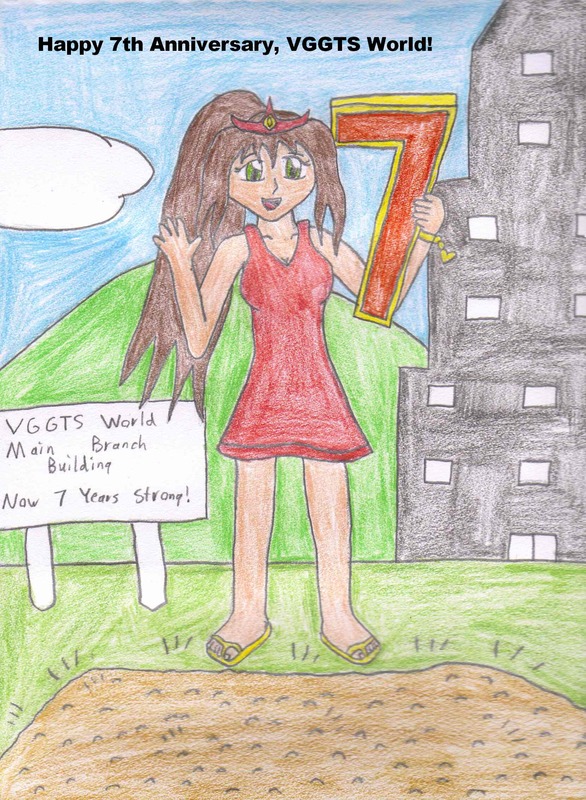 BlazingBarrager asked if he could include the character in his first story for VGGTS World, Defender of Giant Land. At first I said no, but after thinking about it a couple days, I changed my mind and let him do it. I thought, you know? Apple's only been in one story, and I was probably never ever going to write about her again, so what's the point of keeping her locked up in my head? The story did pretty well, I thought. One person at VGGTS2 said she remembered Apple as well, but without a pic or an image refrence, it was hard to picture what she looks like. I agreed with her, saying I've been hoping someone would make a picture of her, but no takers. No takers, at least... until Lamsey stepped up to the plate. 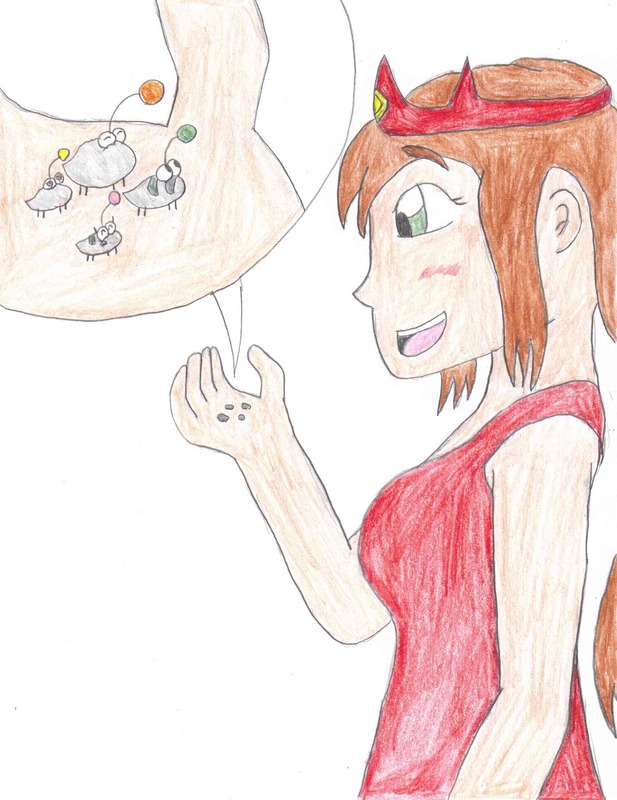 After passing off every single detail I could of Apple's appearance to a friend, Princess Apple had her very first drawing two weeks later. The drawing was very close to being spot-on. 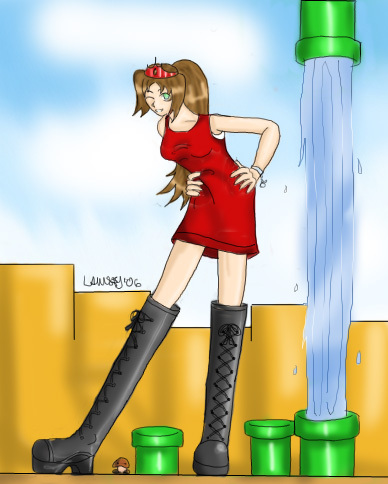 I didn't imagine her boots THAT high up her legs, but everything else was right. 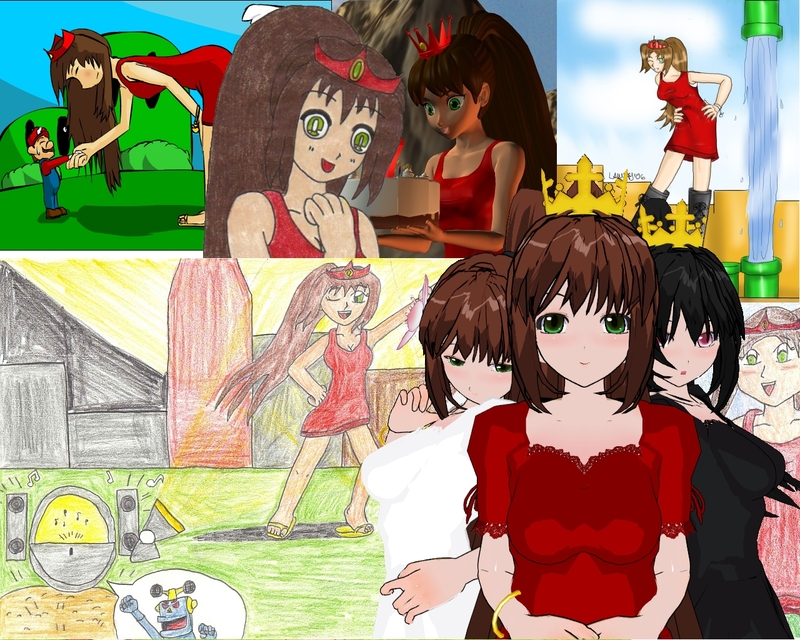 The short red dress, the red tiara with golden seed, the brown hair wrapped in a long ponytail, the green eyes, and the golden/silver bracelet on her left wrist. 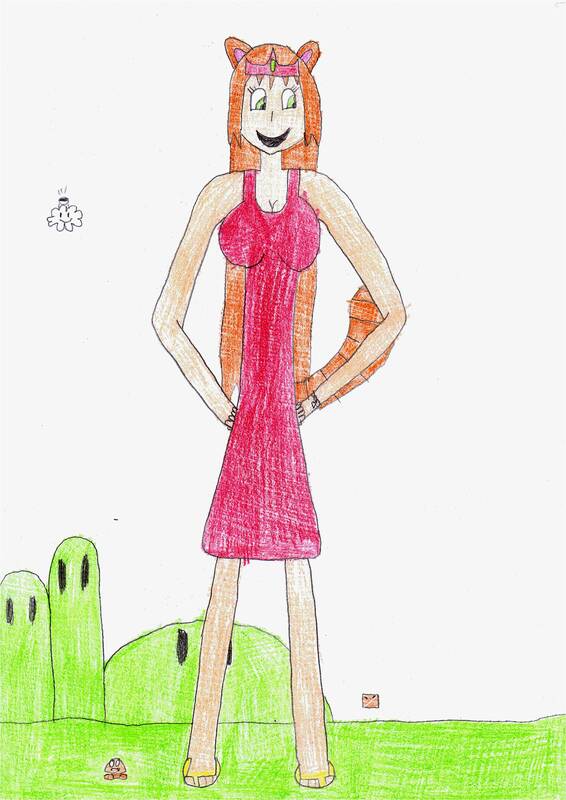 I envisioned her wearing long boots to make her look like she's a tougher princess, even though she's really very sweet and easy to get along with. Yet, after I saw that drawing, that's when I realized that kind of combination may not have meshed as well as I originally thought. That's why later drawings (particularly Twilight Prince's which is exactly how I imagined Apple) and stories have her wearing golden sandals... to give her more of a goddess look, although she'll still whip out the boots in cold environments. 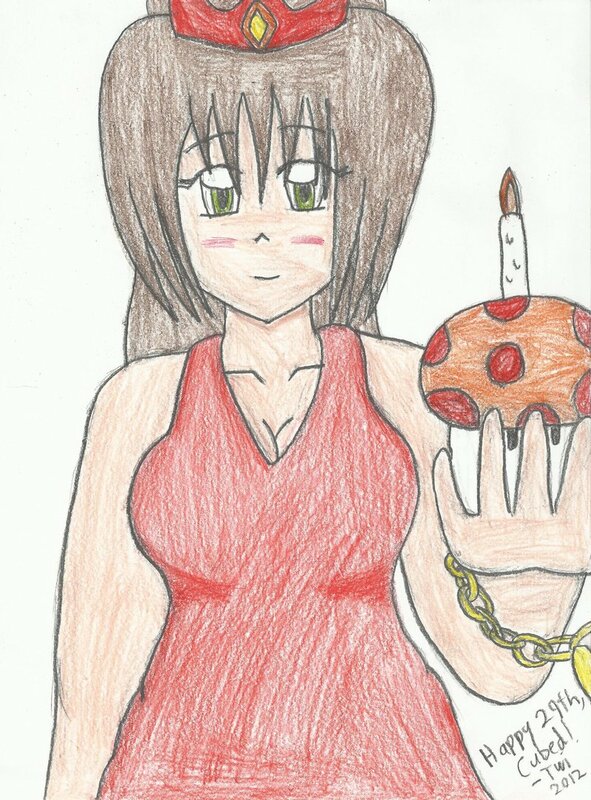 Eventually, a second author in early 2007 (Final7Darkness) asked for and was granted permission to add Apple into his story, and it was around that time when the character started to pick up steam. Some people actually wanted to see her appear more often! 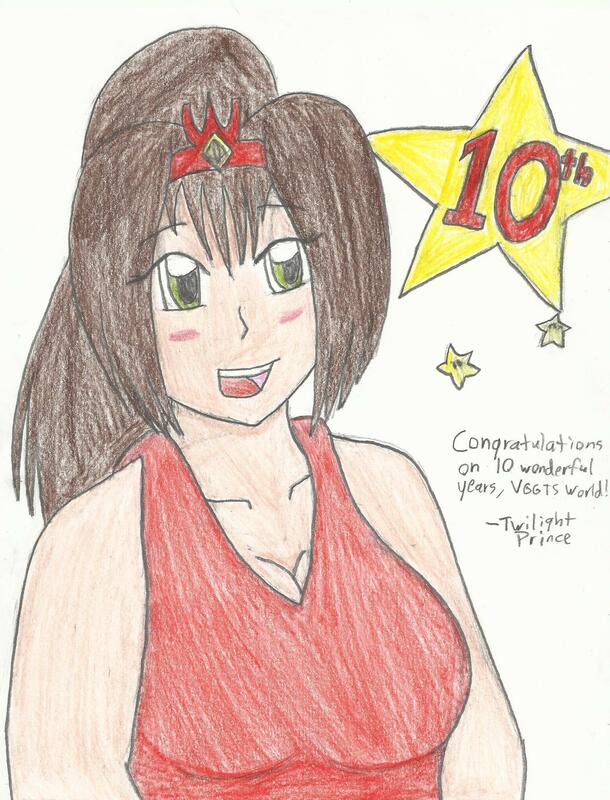 I also realized that I've never really told her backstory before... the very backstory I originally wanted to write at the end of the last millennium! 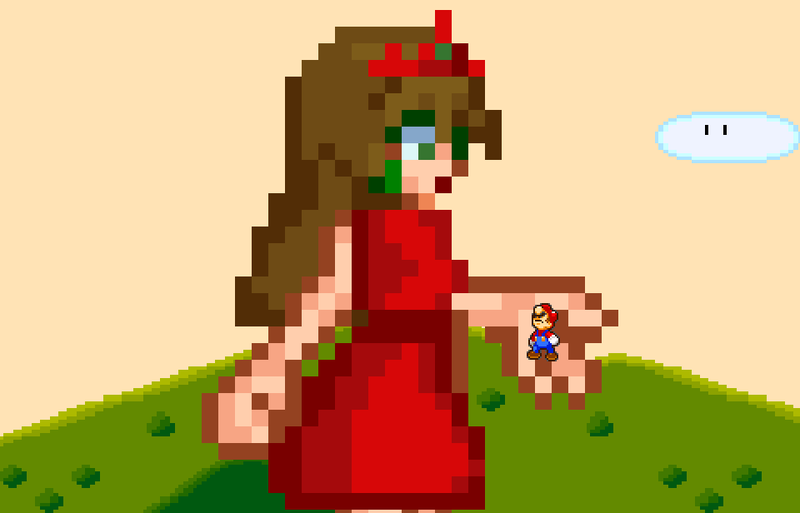 Of course, I made quite a few changes to reflect the changing Mario universe from 1999 to 2007 when I thought of Birth of a Big Apple (you'll see those changes in a little bit). 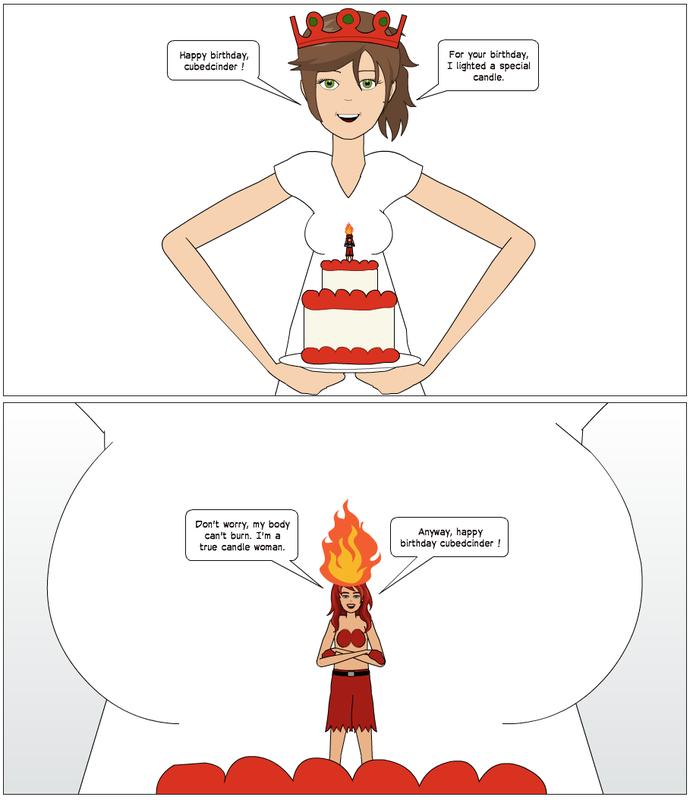 So I spent almost the whole month of August writing Birth of a Big Apple, eventually posting it on August 31st, 2007. 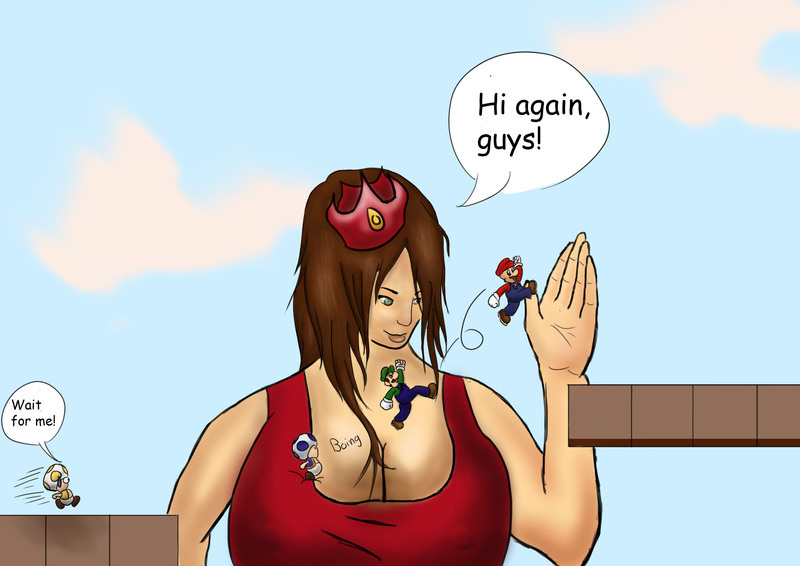 It quickly became one of the most popular stories on the website, despite the giantess not being in any Mario game whatsoever. Hey, if they loved it, it didn't bother me! 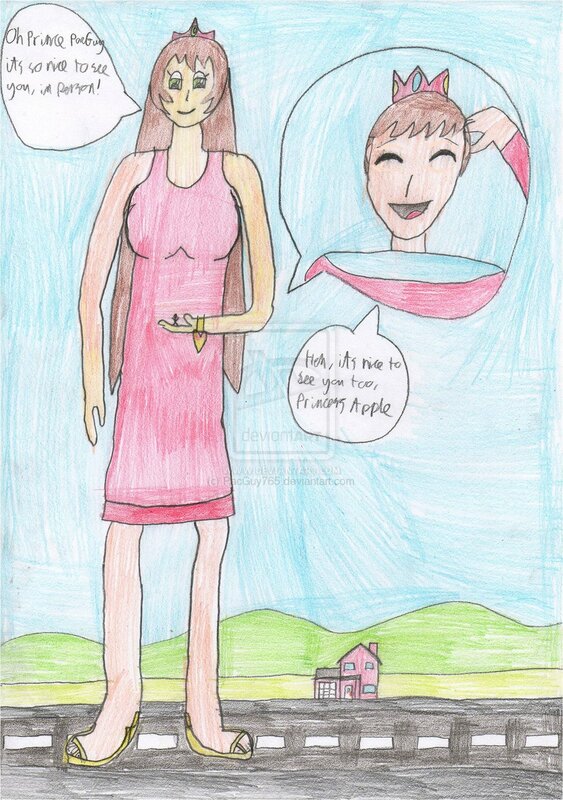 Back when I first thought of Apple, she was the only child of the family, parents of an unnamed land that wasn't far from Giant Land. The unnamed land was destroyed in an attack by Bowser, forcing the family to relocate to another land. It was during their rest stop in Giant Land where Apple discovered the Ultra Mushroom. 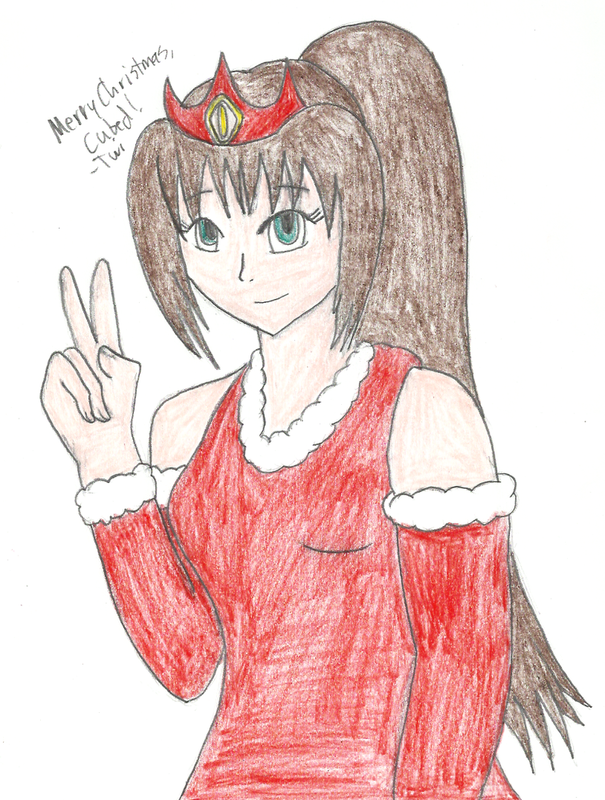 Eventually, this idea was abandoned and would instead become the peaceful, but little known, predecessor (because I made it up) to Diamond City of the WarioWare franchise, Jewel Town. 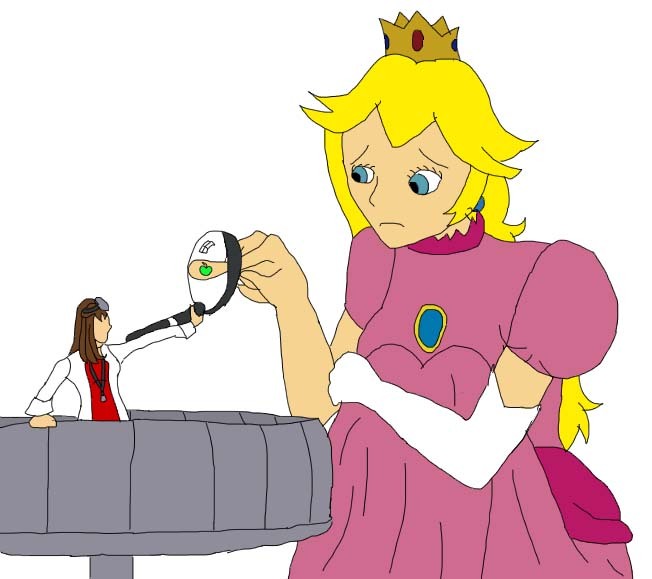 In both versions, Apple works briefly as an apprentice to Princess Peach to learn what it's like to be a princess. I didn't think of Apple having a sister until around 2003, when I was playing TMNT Tournament Fighters on Super NES. I've always thought it was a crying shame that Aska was pretty much forgotten despite being a very attractive addition to the TMNT franchise, though this was before I discovered she was created by Konami just for that game. 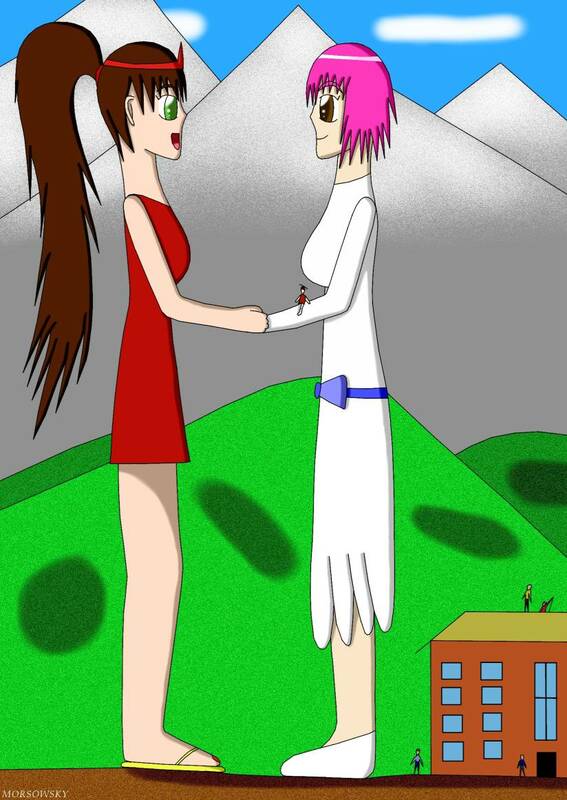 So I incorporated her into the story. I thought Aska's desire to take up martial arts instead of being a princess would help give Apple more of a reason to become a princess. 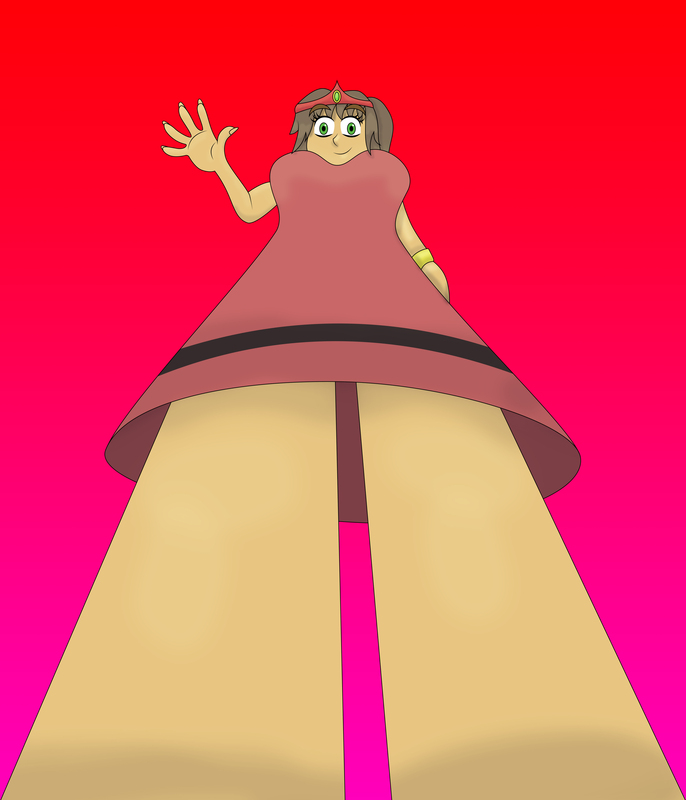 Apple's parents originally stayed with their daughter even after she became a giantess. Obviously, I changed that when I wanted to focus much more on Apple herself for the story, and in case of future stories. 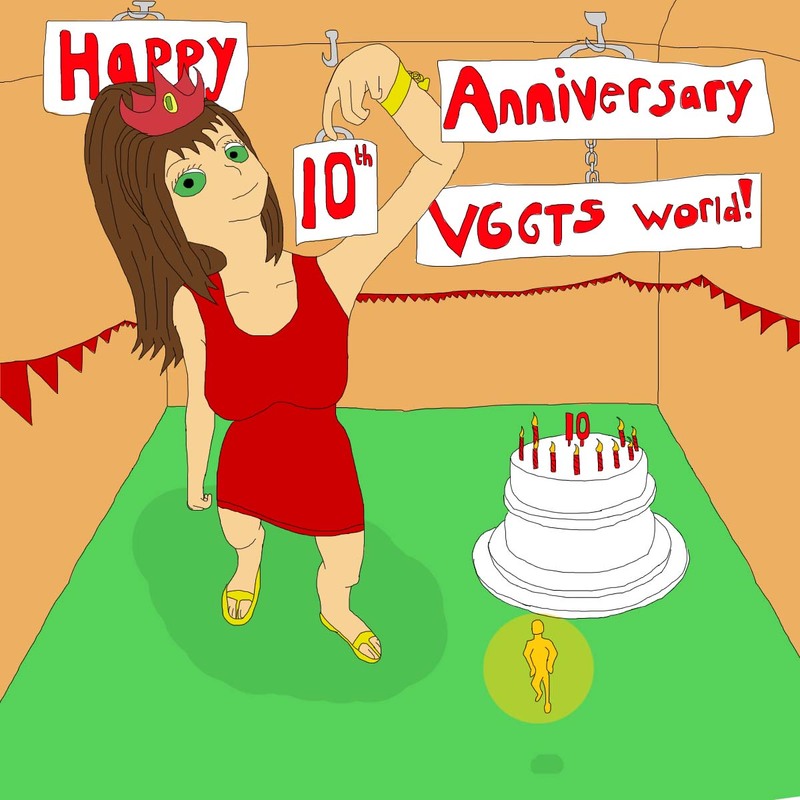 The divorce idea came from my parents' near-divorce in real life near the end of 2006. Between the Fire and Dark powerups for Princess Apple in The Legend of Rymas and the Mermaid power in Twilight Prince's outstanding story, Apple's Grand Tour, I've decided to create this little guide that details what kind of changes the giant princess goes through when using an item from the Super Mario series. Use it as a guide if you're making a picture or story with Apple in it and want her to use special powers (remember to ask first, of course!). Apple - Apple's regular look. 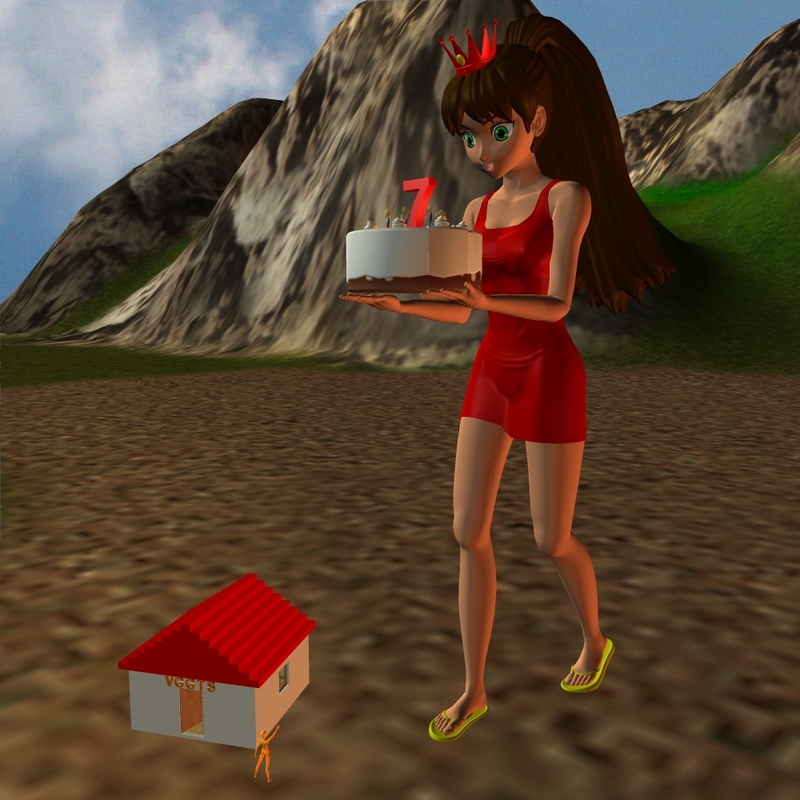 She wears a short red dress (no sleeves; moderate-sized chest), red tiara with golden seed, brown hair wrapped in a long ponytail, green eyes, golden sandals, and a golden/silver bracelet on either wrist. Inside the bracelet is a picture of herself and her family from years past, and by pressing down on the picture, it reveals a fragment of the Enlargium crystal. By connecting her thoughts with the crystal, it fires a beam that temporarily enlarges anyone or anything to her size up to 60 minutes. 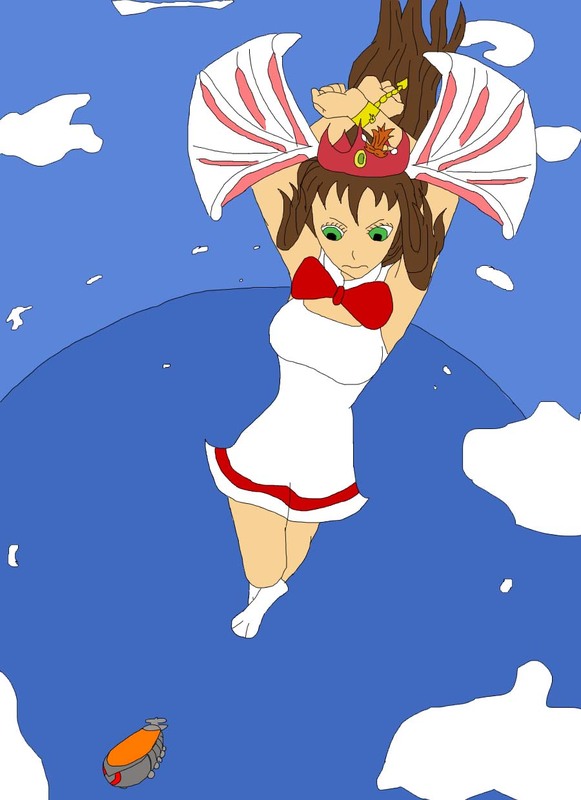 Fire Apple (Fire Flower) - Apple's dress becomes white and the tiara on her head disappears, being replaced with a fire flower attached to Apple's hair (on either side of her head). 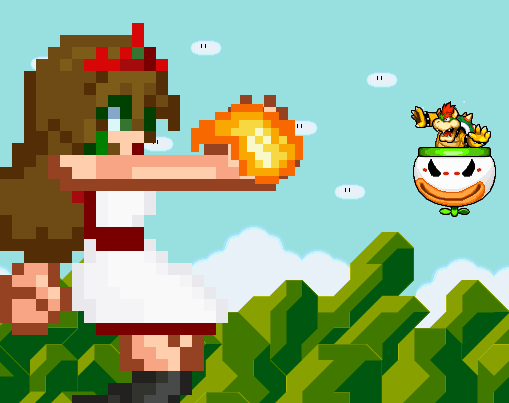 Like with Fire Mario, Fire Apple can shoot fireballs from her hands. Thanks to XryEcho (and his game, The Legend of Rymas) for coming up with this one. 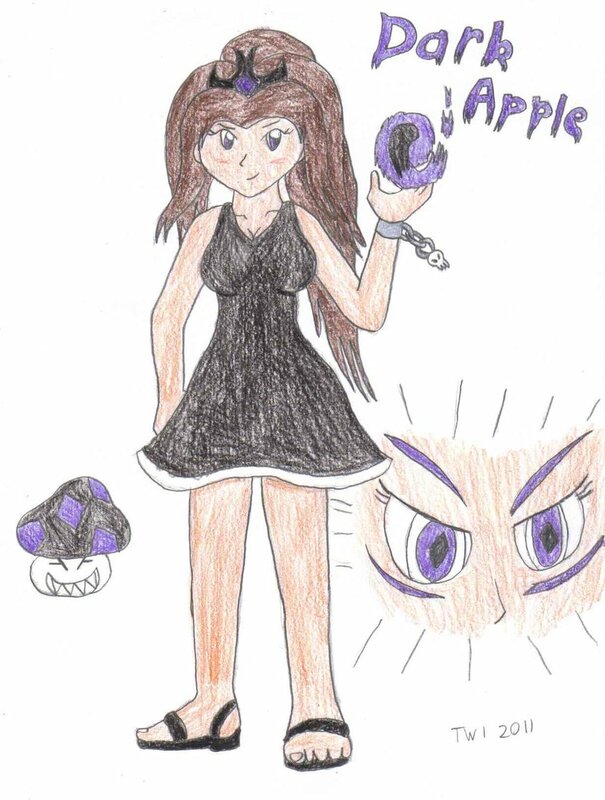 Dark Apple (Dark Shroom) - Apple's dress and tiara both become black. 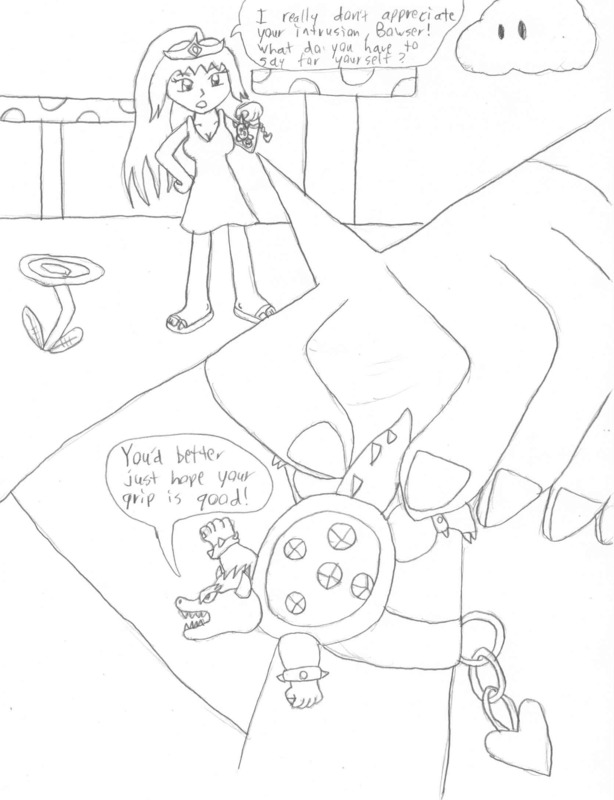 Also, her eyes change color from green to purple, her sandals change color to black with a small heel and an extra strap around the heel, and the heart on Apple's bracelet changes into a skull. She can shoot fireballs (colored purple and black this time) and can also give a mean stare that will temporarily freeze anyone with fear. In this form, Apple is susceptible to light. If Apple steps into the light in this form, she loses it and reverts back to normal Princess Apple. While this form does grant her a more darker power, she still keeps her morality intact, though she does tend to get a bit temperamental more easily. As for the Dark Shroom itself, it is an item only found in Giant Land and a lot of mystery surrounds how and why it was created... Thanks to XryEcho (and his game, The Legend of Rymas) for coming up with this one, and also to Twilight Prince for some other design changes. Ice Apple (Ice Flower) - Apple's dress becomes dark blue, as does the color of her eyes (going from green to blue). The tiara is replaced with an ice flower on either side of Apple's head, much like the Fire Flower. Much like Ice Mario from New Super Mario Bros. Wii, Apple can throw balls of ice or form a shield made fully out of ice crystals. In addition, she has super cold breath. One blow will instantly freeze anything that comes into contact. Mermaid Apple (Frog Suit) - The frog suit that normally changes Mario into Frog Mario will instead completely change Apple. 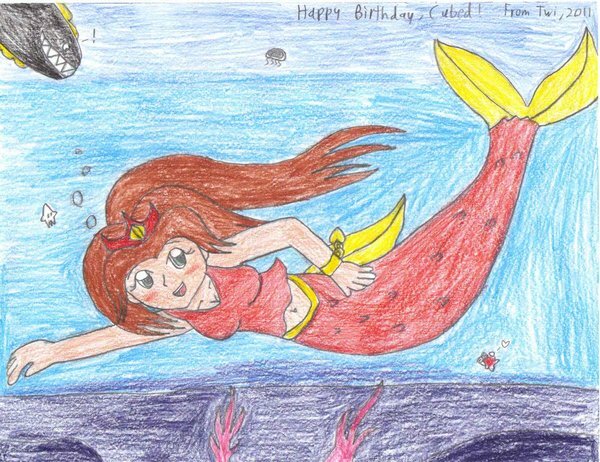 The lower half of her body is replaced with a red and yellow mermaid's tail, allowing her to swim more easily in bodies of water. No other powers come with this form. Thanks to Twilight Prince for coming up with this one. Sky Apple (Cape Feather) - Apple's dress becomes sky blue. Instead of a yellow cape, when Apple touches a feather, she will sprout a pair of angel wings. 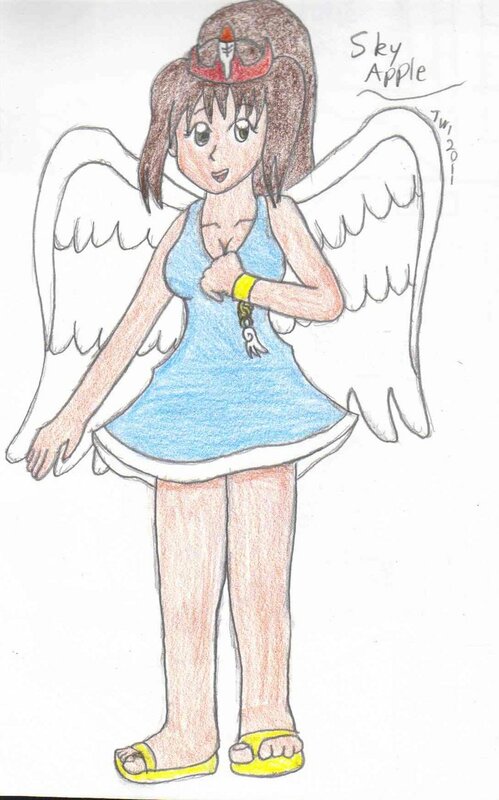 The wings allow her to fly for a very short period of time (about as long as Princess Peach can float in the air), and she can also flap them to create a huge gust and blow enemies away. Thanks to Twilight Prince for coming up with this one. 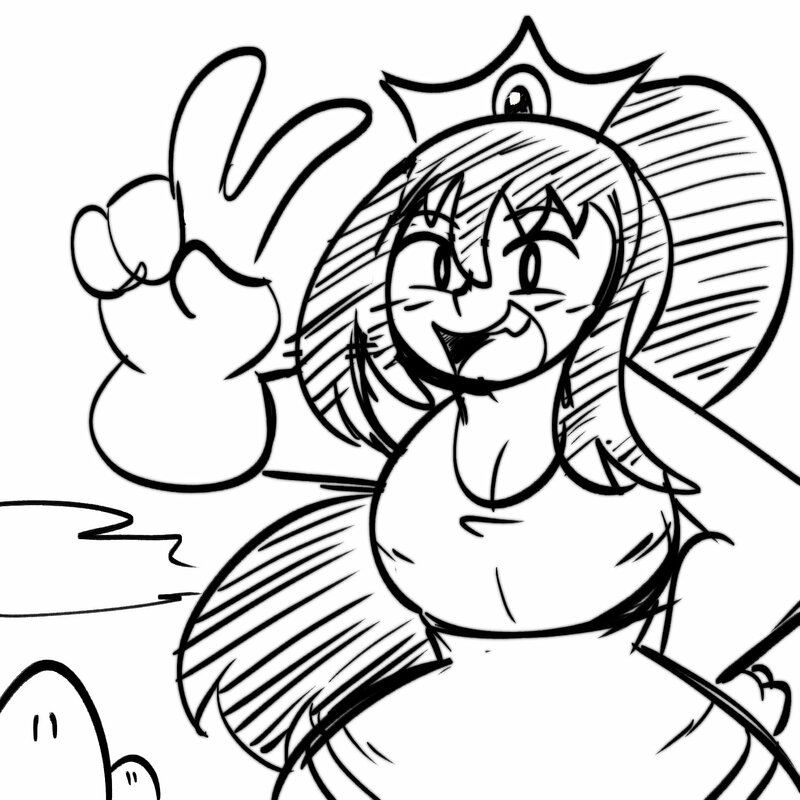 Bunny Apple (Carrot from Super Mario Land 2) - Apple's dress becomes white with a red stripe running all around the bottom. 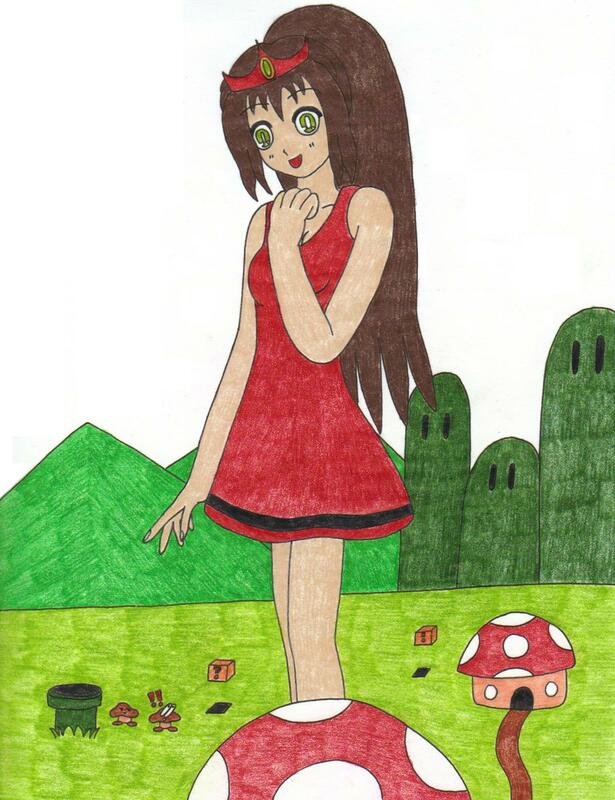 Like with Bunny Mario from Super Mario Land 2: 6 Golden Coins for Game Boy, Apple sports rabbit ears that allow her to jump high and slow down any descent (by flapping the ears). 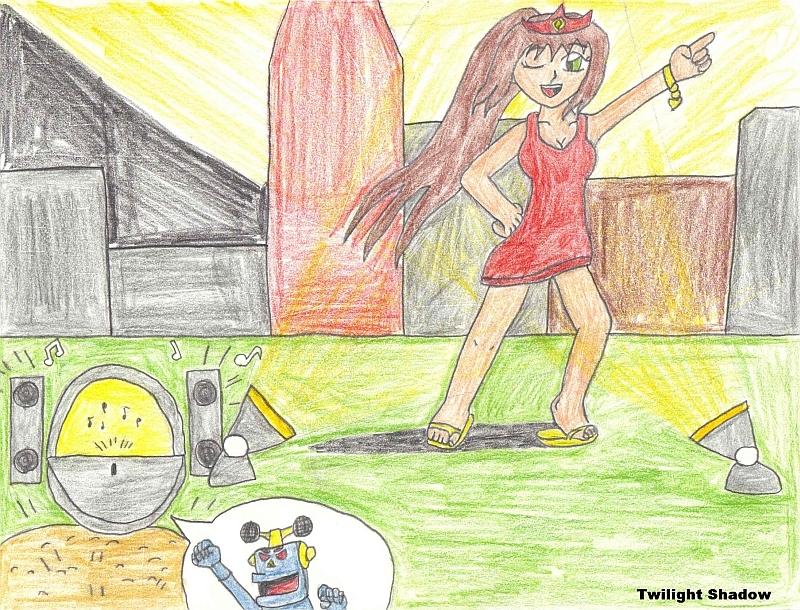 She also wears a large red bow tie around her neck and has bunny feet instead of her usual golden sandals. Thanks to Final7Darkness for coming up with this one. Hammer Apple (Hammer Bros. Suit) - Donning a Hammer Suit, Apple's dress is completely redone into an armored dark grey Hammer Bros. suit with bright yellow outlines. 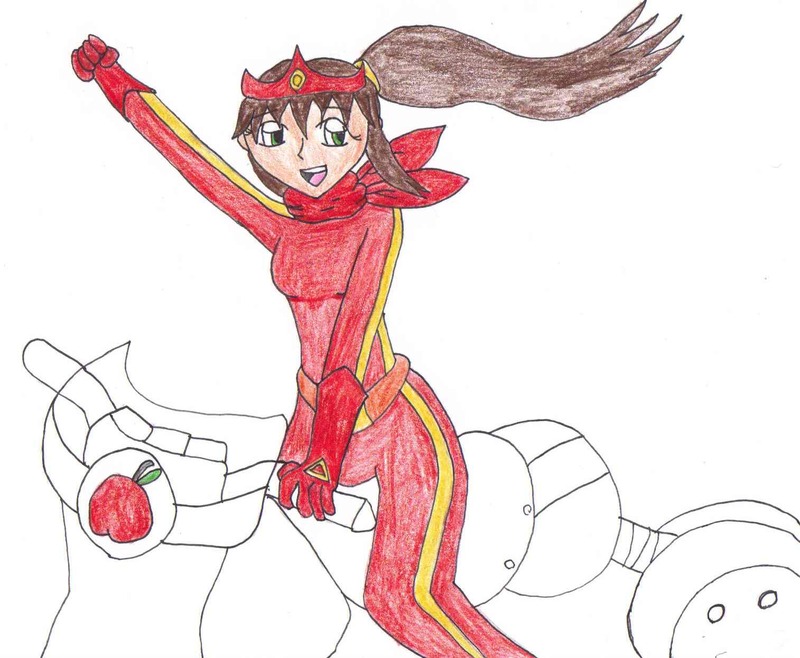 The chestpiece shows an apple insignia, and her crown transforms into a helmet that still dons the golden apple seed on the front and also sports a hole in the back for her ponytail. Her stomach is exposed in this attire, and the lower part is a lightweight but durable dark grey skirt with yellow outlines. Her golden sandals are swapped around for a familiar pair of boots that have a slight alteration to their original look. 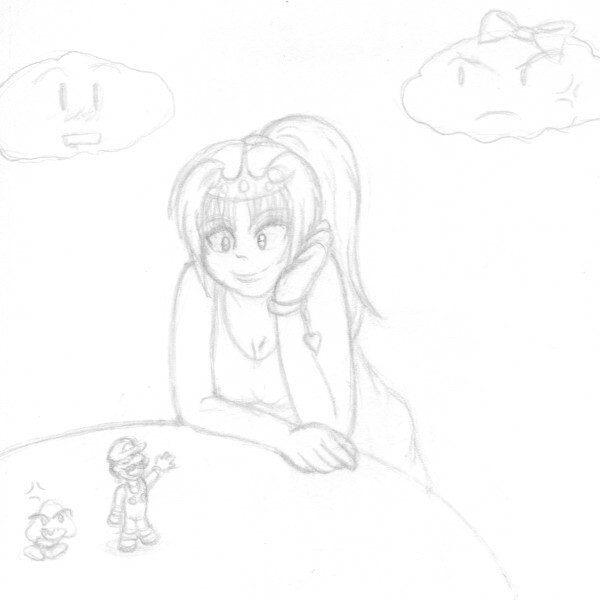 In this form, Apple has all of the usual abilities the Hammer Suit bestows onto Mario and friends, such as a hammer toss and a firepoof shell that she can use to deflect fireballs. Being from Giant Land, however, Apple also is bestowed another ability, one suitable to her size. As if they likely weren't strong enough to do this, Apple takes a page from Sledgehammer Bros. and can stomp the ground, causing it to shake and stun anything within a large radius around her. 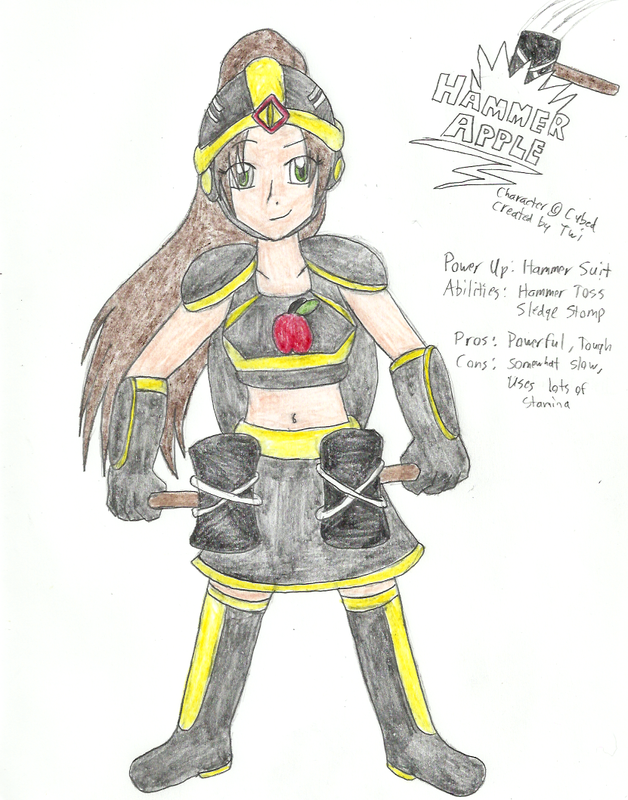 It is very clear that this powerup state is Apple's most powerful one, bestowing her boosted strength and defenses. The cost of this however is that Apple is a far bit more sluggish in this form, likely due to the extra armor on her. As such, this requires her to use more stamina than usual. 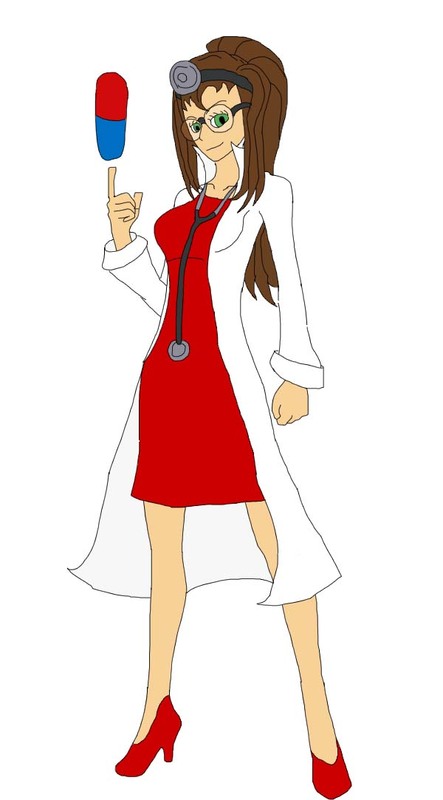 Effectively, this form is meant only for dire emergencies, as while she will be quite potent in what she does, she will have little time to use it before tiring out. Thanks to Twilight Prince for coming up with this one. 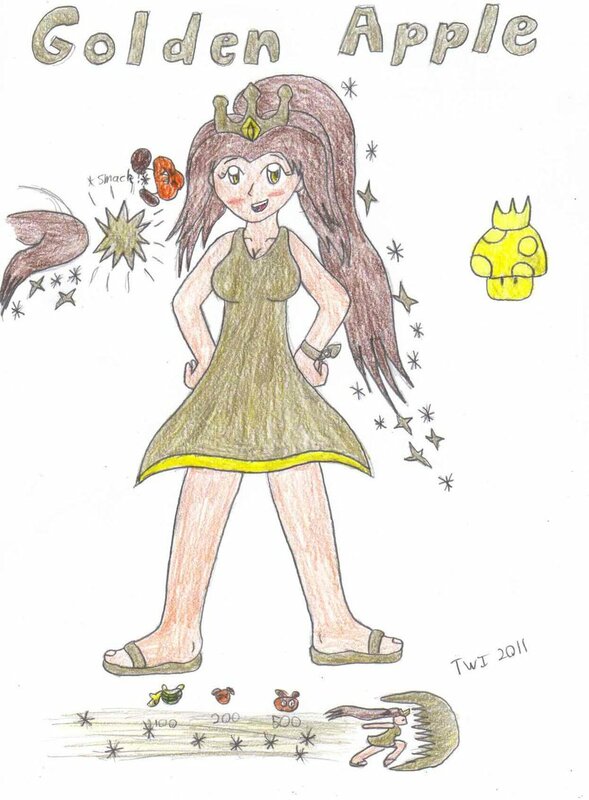 Golden Apple (Golden Mushroom from the Mario Kart series) - Princess Apple's entire outfit ensemble changes to a golden yellow. 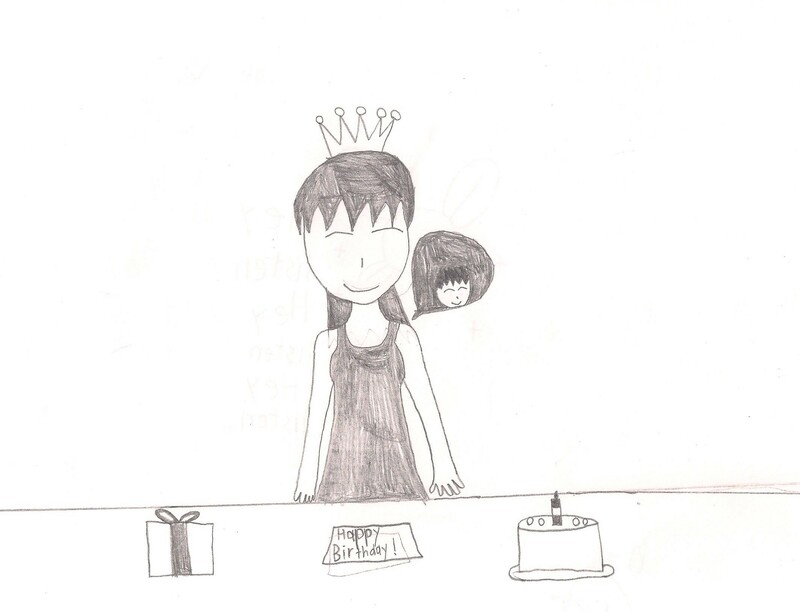 Her tiara becomes a full-fledged crown. Her ponytail shimmers with golden sparkles. Golden Apple's most notable ability is to run at fast speeds. When she runs fast enough without being interrupted, she gets to maximum speed and creates an Speed Shield in front of her, which allows her to mow over any enemy in her path. This boost is temporary, though, and if she runs at max speed for too long, she'll tire out and become vulnerable for a short period. Golden Apple also has the ability to use her ponytail as a weapon, allowing her a secondary attack to simply jumping on enemies. Despite the look of her, Golden Apple is not invincible, unless she's going at maximum speed and has the Speed Shield up, but even then, that invulnerability is only brief. Being so fast, Golden Apple has a hard time controlling her velocity, making it hard to turn on a dime or come to a full stop. Thanks to Twilight Prince for coming up with this one. 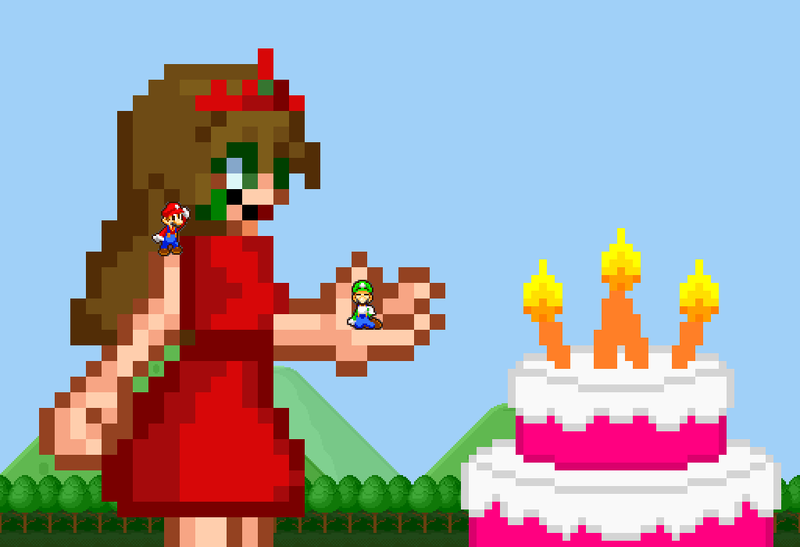 Thanks go to Luminar for making the following tribute video of Princess Apple, set to the Giant Land theme from Super Mario Bros. 3 (NES).